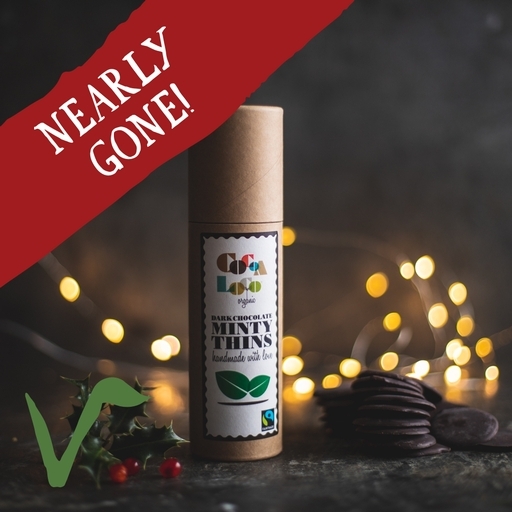 We love these delicate organic chocolate thins with a touch of mint. They’re handmade by artisanal British chocolatiers Cocoa Loco with bittersweet 73% dark chocolate and a cooling splash of mint oil. Especially good as an after-dinner treat with a steaming cup of coffee. Cocoa Loco is a small, artisan chocolate company operating from their ‘Chocolate Barn’ in the heart of West Sussex. Their award-winning chocolates are Fairtrade, organic and handmade in small batches by expert chocolatiers. We’re fans. Dark chocolate (73%) (cocoa mass, sugar, cocoa butter, vanilla powder), sugar, peppermint oil (0.2%).